McShane Construction Company completed the general construction services for Trumpf Smart Factory, a 56,297-square-foot build-to-suit office and showroom facility located in Hoffman Estates, Illinois. 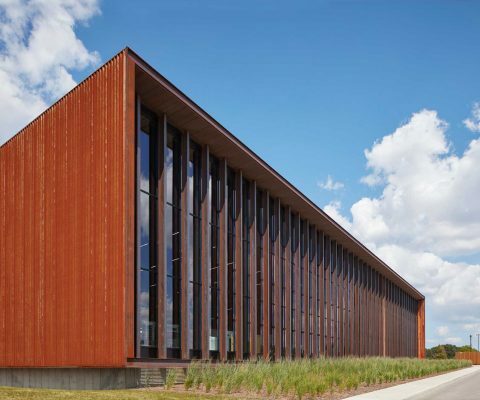 The facility features a glass curtainwall and corten steel panel rainscreen exterior with a central courtyard encompassing decorative stone and shade trees for employees and visitors. The single and multi-story facility includes a 31,171-square-foot showroom area with 150′ clear span custom truss system fabricated by Trumpf machine equipment, allowing visitors to observe live sheet metal production. A custom-made catwalk with a balcony spans the mezzanine area of the showroom to feature production processes from above. A 25,126-square-foot office area includes an auditorium, open and private offices and multimedia room.